Russia says that a chemical attack that killed and injured dozens of civilians in a rebel-held town in northern Syria came from rebel weapons on the ground. Its defence ministry acknowledged that Syrian planes had attacked the town of Khan Sheikhoun in Idlib province. But it said the aircraft had struck a depot producing mines filled with a poisonous substance, for use in Iraq. The US and others said Syrian planes dropped chemical weapons, which Damascus denied. UK-based monitoring group the Syrian Observatory for Human Rights put the death toll in Khan Sheikhoun at 72, including 20 children. Footage from the scene showed civilians, many of them children, choking and foaming at the mouth. Witnesses said clinics treating the injured were then targeted by air strikes. The Observatory cites reports from the area saying it was subjected to a further wave of air strikes on Wednesday. The issue will overshadow a conference under way in Brussels, at which 70 donor nations will discuss aid efforts in Syria. Delegates want to step up humanitarian access for thousands of civilians trapped by fighting. The UN Security Council is also due to hold emergency talks later following the incident. What do the Russians say? Russia, which backs Bashar Assad’s government, released a statement on YouTube. “Yesterday [Tuesday], from 11:30am to 12:30pm local time, Syrian aviation made a strike on a large terrorist ammunition depot and a concentration of military hardware in the eastern outskirts of Khan Sheikhoun town,” Russian defence ministry spokesman Igor Konoshenkov said. 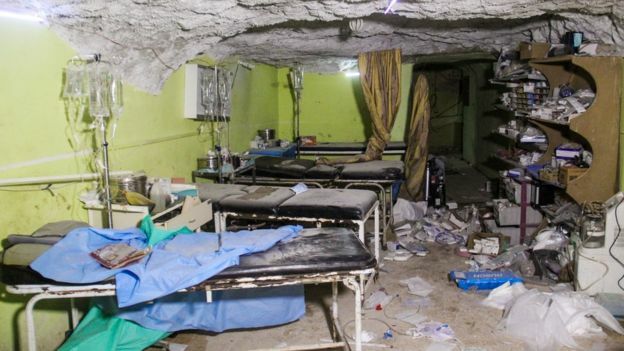 He said the chemical munitions had been used by rebels in the city of Aleppo last year. 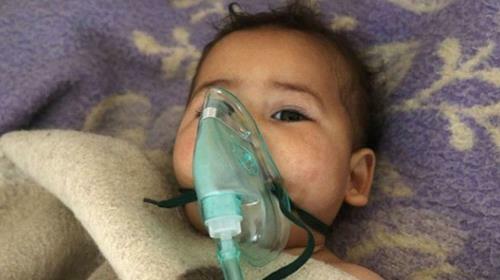 “The poisoning symptoms of the victims in Khan Sheikhoun shown on videos in social networks are the same as they were in autumn of the previous year in Aleppo,” he added. How have Western countries reacted? Wednesday’s emergency meeting of the UN Security Council was called by France and the UK as international outrage mounted over the attack. Britain’s ambassador to the UN, Matthew Rycroft, said the incident was “very bad news for peace in Syria”. “This is clearly a war crime and I call on the Security Council members who have previously used their vetoes to defend the indefensible to change their course,” he told reporters in New York. In a statement, US President Donald Trump condemned what he called “these heinous actions” by the government of Syrian President Bashar al-Assad. He also blamed his predecessor, Barack Obama, for what he termed his “weakness” on Syria. Critics pointed to tweets by Mr Trump dating back to 2013 that urged the US government to ignore Syria and focus on domestic problems. US Secretary of State Rex Tillerson accused the Syrian government of “brutal, unabashed barbarism”. UN Syria envoy Staffan de Mistura said it was a “horrific” attack and that there should be a “clear identification of responsibilities and accountability” for it. A summit on the future of Syria was always going to be difficult. This latest attack makes it even harder. The European Union wants to start moving, however carefully, towards a discussion of how to rebuild Syria. It wants to use a prospect of funds as leverage in faltering peace talks at a time when momentum on the battlefield has shifted decisively toward the Syrian military and its allies. But more civilian suffering will bolster those who insist there can be no money for reconstruction in government-held areas while destruction goes on. Another atrocity also highlights again the failure of world powers to find a way out of this punishing war. One after another, world leaders announced their arrival in Brussels with strongly worded condemnation, and warnings of “a price to pay”. But, yet again, Syrian civilians are paying the heaviest price of all. Syria’s civil war has raged for more than six years, with no political solution in sight. Nearly five million Syrians have fled the country and more than six million are internally displaced, the UN says. More than 250,000 people have been killed.